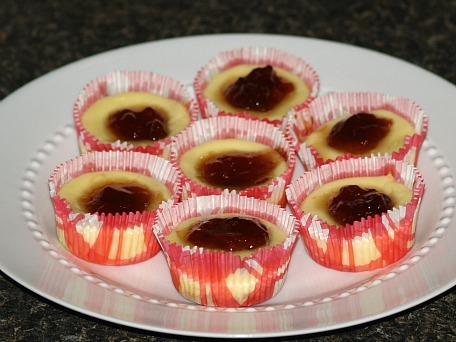 When learning how to make Mini cheesecake recipes you will find they are very convenient for many occasions. Even though I love the large elegant cheesecakes, there are many reasons to make small individual desserts. This is not to say that these small desserts cannot be elegant also. They certainly can be with a little decorating or garnishing. Because cheesecake recipes are so loved all over the world, this is reason enough to lean how to make mini cheesecake recipes. These individual servings are great to add to a buffet dinner. Each one can be garnished with fruit and whipped cream which will be a hit even on an elaborate buffet. Because they need no cutting or dipping this dessert is very convenient on a buffet. As I said cheesecake is a favorite dessert of many; men, women and children. The mini cheesecake recipes can provide a great dessert for carry in dinners, picnics, camp outs or any occasion imaginable. Any type of decoration can easily make them fit into any celebration or get together. Whether your recipe instructs you to bake or one that does not need baking mini cheesecake recipes can easily be prepared in cupcake tins or muffin tins. Lining the tins with foil cups or paper cups provides easy serving for any occasion. The history of the individual cupcake takes us all the way back to the eighteenth century. In recent years this serving size has even become more popular. Combining the obsession for cupcakes with the obsession around the world for cheesecake, can you think of a better reason to learn how to make mini cheesecake recipes for your next social event. INDIVIDUAL CHEESECAKE RECIPE This mini cheesecake recipe makes great individual servings for a buffet. Preheat oven to 350F degrees; line 6 or 7 regular size muffin tins with paper liners. Combine and blend graham cracker crumbs and melted butter; spoon 2 teaspoons in each paper liner. Beat cream cheese until creamy and light; gradually add sugar while beating. Add egg and vanilla and beat well; spoon mixture on top of crumb mixture in paper liners. Bake about 15 to 20 minutes; spoon ½ teaspoon strawberry preserves over each cheesecake. Grease and flour 9 X 13 inch baking pan. In large saucepan over low heat melt ½ cup butter and 1 ounce chopped chocolate while stirring. Add 1 cup flour, 1 cup sugar, baking powder, 1 teaspoon vanilla, 2 eggs and ¾ cup chopped nuts. Blend mixture well and spread into prepared pan. In small bowl combine all the filling ingredients except the ¼ cup nuts and chocolate chips. Beat mixture on medium speed until smooth and fluffy. Stir nuts into filling; spread over chocolate mixture in pan. Bake for 25 to 35 minutes or until pick comes out clean. Immediately sprinkle marshmallows over top; return to oven an additional 2 minutes. For frosting in large saucepan over low heat combine ¼ cup butter, milk, 1 ounce chocolate and reserved 2 ounces cream cheese stir mixture until well blended. Remove from heat and stir in powdered sugar and 1 teaspoon vanilla stirring until smooth. Immediately pour frosting over the marshmallows and lightly swirl chocolate and marshmallow. Refrigerate until firm; cut into bars. Mix cheesecake crumbs, sugar and butter; press into bottoms of each of 12 foil lined muffin cups. Beat milk and filling mix on low speed until blended; beat on medium for 3 minutes. Divide and spoon over crumb mixture in each cup (Mixture will be thick). Refrigerate for at least 1 hour; garnish with fruit or melted chocolate to serve. Place vanilla wafers flat side down on bottom of each of 18 paper lined cupcake cups. Combine cream cheese, sugar, juice, lemon peel and vanilla. Pour mixture into baking cups filling each cup almost full. Bake in preheated oven at 325F degrees for 25 minutes. Top each with preserves and refrigerate. Preheat oven to 350F degrees; grease 8 muffin cups. Combine cream cheese and egg in medium bowl; beat until smooth. Add powdered sugar, almonds and extract; mix well. Separate dough into 4 rectangles; roll each into a 8 X 4 inch rectangle. Cut each in half to form 8 squares. Press each into bottom of a greased muffin cup leaving corners of each extending over sides of a cup. Place about ¼ cup of cream cheese mixture in each cup. Bring 4 corners of dough together in center of cups; firmly press together to seal. Bake for 18 to 23 minutes or until golden brown. Immediate remove from muffin cups. Combine all topping ingredients in small saucepan; cook until bubbly and butter melts. Serve over warm dessert; store in refrigerator. This is one of the mini cheesecake recipes which is baked in tart dishes for individual servings. Fill two 9 X 13 inch baking pans with hot water to 1 inch depth. Place twelve 6 ounce custard cups in the hot water. Cook stirring constantly over low heat for 2 minutes or until sugar is dissolved. Bring to a boil; boil without stirring for 10 to 15 minutes or until golden brown. Quickly pour evenly into custard cups. Combine evaporated milk, sweetened condensed milk, cream cheese, butter, eggs and vanilla. Beat until smooth; pour evenly into prepared custard cups. Bake for 35 to 45 minutes or until knife inserted in center comes out clean. Remove custard cups from baking pans; chill for several hours or overnight. Run knife around rims and shake gently to loosen; invert on serving dishes. Combine in a small bowl cream cheese, powdered sugar and lemon juice; blend well. Line tray with wax paper; place cake cups on top. Spread tops and sides of each cake cup with the cream cheese mixture; refrigerate. When ready to serve place each cake on a plate and fill center of each with ¼ cup fresh fruit. Combine crumbs sugar and butter; blend well. Divide evenly and press mixture on bottom of 24 paper lined cupcake tins. Beat cream cheese in large mixing bowl until fluffy. Add eggs and vanilla mixing well; spoon equal amounts into prepared cups. Bake 20 minutes or until tops spring back when lightly touched. Cool to room temperature; chill until cold and garnish as desired. Preheat oven to 300F degrees; line mini size pan with foil liners. Beat cream cheese in a large mixing bowl until smooth. Add eggs, 1 cup sugar and vanilla beating until well blended and smooth. Drop mixture into prepared cups ¾ full; bake 30 to 40 minutes to set then cool. Combine sour cream, ¼ cup sugar and vanilla until blended. Top each midget with ½ teaspoon of mixture then top with ½ teaspoon preserves. Bake for 5 minutes and then cool; refrigerate or can be frozen. Learn how to make cheesecake with phyllo pastry. Place 1 sheet phyllo pastry on damp cloth (Keep remaining pastry wrapped). Lightly brush pastry with melted butter. Layer 3 more sheets on first sheet brushing each sheet with butter. Repeat making another stack of 4 sheets. Use kitchen shears and cut each stack into 3 inch squares. Brush miniature muffin tins with melted butter. Place one layered phyllo in each muffin cup pressing gently to form shell. Bake 8 to 10 minutes until golden brown; gently remove from pan to cool. TO MAKE FILLING combine cream cheese and powdered sugar in mixing bowl. Add orange rind and 1 tablespoon orange juice; beat on high until blended. Spoon 1 ½ teaspoons filling into each pastry cup. FOR TOPPING combine orange marmalade and the 2 teaspoons orange juice. Top each cheesecake with ½ teaspoon of marmalade mixture. Refrigerate until ready to serve; makes 40.